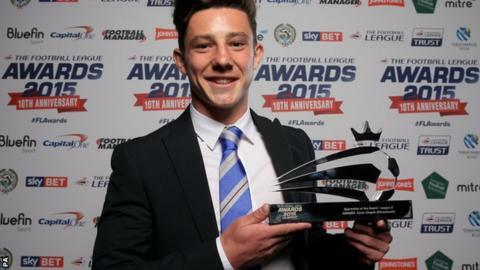 Portsmouth striker Conor Chaplin says he is keen to sign a new contract with the League Two club. The 18-year-old scored twice in Pompey's 3-1 win against Barnet on Saturday after being handed his first league start of the season. Chaplin also grabbed the headlines in the League Cup, scoring against Championship sides Derby and Reading. "I don't want to be playing my football anywhere else, that's all I've got to say on that," he told BBC Radio Solent. Chaplin, named League Two apprentice of the year in April, is currently under contract until the end of the season. He has been among a number of academy graduates given their chance in the first team since the arrival of manager Paul Cook in the summer. "I knew an opportunity to start a league game would come, I just had to be patient," he added. "When those opportunities come, you've got to take them in football. If you do, you'll have a more successful time in the game." Portsmouth are the only unbeaten side remaining in League Two following defeats on Saturday for Wycombe and Oxford United, who Pompey face next at the Kassam Stadium on Saturday.